Crimea: One of the original Crimean mech abilities (Wayfare) is a non-factor in 6-7 player games. In a game of this size, the Crimean faction should replace the Wayfare ability with this new ability (placing the appropriate punchboard token on their faction mat): Move to any unoccupied farm. Polania: The original Polania faction ability (Meander) results in a minimal benefit in 6-7 player games. When playing games of this size, the Polania faction should replace the Meander ability with this new ability (placing the appropriate punchboard token on their faction mat): Pick up to 2 options per encounter card. At end of game, gain $3 for each encounter territory you control. 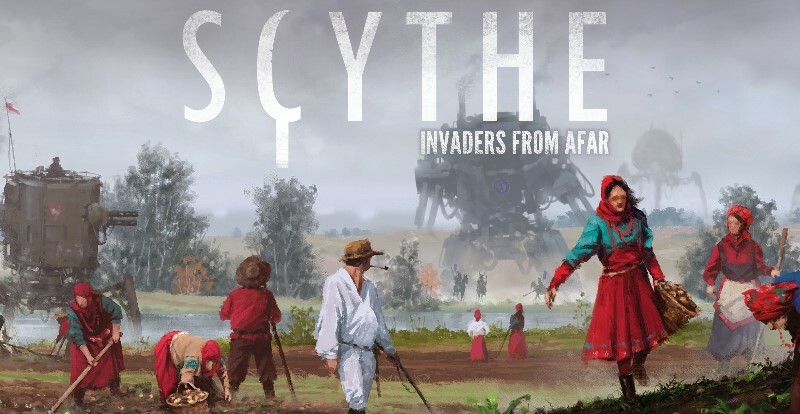 New Players: If this is a player's first time playing Scythe, we highly recommend they randomly select one of the original factions, not Albion or Togawa. Overlapping Turns: Regardless of the player count, you may begin your turn once the player to your right starts to take a bottom-row action. First Player: The new Player Mats-which are now shuffled in with the other Player Mats during setup for all games of Scythe regardless of player count-are numbered 2a and 3a. These numbers only matter when you are determining the first player based on the lowestnumbered player mat: The order is 1, 2, 2a, 3, 3a, 4, 5. Faction Ability (Exalt): After ending your character's movement (post-combat and post-encounter), the Albion player may place a Flag token from their supply on the character's territory. A territory can only have 1 faction token on it (1 Flag or 1 Trap). Flag tokens may not be removed or moved once placed. After being confined to their homeland for centuries, Clan Albion craves control of new territories. This is exemplified by the Albion faction's 4 Flag tokens, each of which counts as an additional territory for end-game scoring to the Albion player if a they control the Flag token's territory with a character, mech, worker, or unoccupied structure AND b the Flag token is not on a territory adjacent to the Albion home base. Burrow: Your character and mechs may cross rivers into, or out of, any adjacent tunnel territory. A territory containing your Mine counts as a tunnel territory, but a territory containing an opponent's Mine does not. Sword: Before you engage in combat as the attacker, the defender loses 2 power. The loss of power is reflected on the Power Track (players cannot have less than 0 power). This happens once per combat, not once per unit. Shield: Before you engage in combat as the defender, gain 2 power. The extra power is reflected on the Power Track. This happens once per combat, not once per unit. Rally: When taking a Move action, your character and mechs can move to any territory that contains at least one of your workers or a Flag token, regardless of the distance. 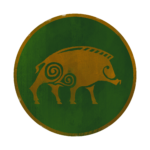 Clan Albion fears that the Factory could fall under permanent control of one of the more powerful factions, which might then encroach on the Albion homeland. With Max by his side, Connor is entrusted with the command of a special taskforce to build a strong line of defense against the other factions and destroy the Factory before it's too late. Faction Ability (Maifuku):After ending your character's movement (post-encounter and post-combat), the Togawa player may place an armed Trap token of their choice from their supply onto the character's territory (even if that territory has an opponent's structure on it). A territory can only have 1 faction token on it (1 Flag or 1 Trap). Trap tokens may not be removed or moved once placed. 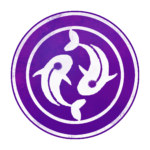 The Togawa Shogunate is united behind a common cause of controlling as much of Eastern Europa as possible… and discouraging other factions from doing the same. They have 4 Trap tokens at their disposal, each with an "armed" and a "disarmed" side. For the purposes of end-game scoring, an armed Trap token grants Togawa control of the territory (no other units are necessary). It is not possible for there to be enemy units in a territory with an armed Trap. Triggering a trap: If an opponent moves a unit onto a territory with an armed Trap token, that unit's movement ends. Flip over the Trap token to reveal a penalty the opponent must incur if possible (e.g., lose 2 popularity). This happens before anything else, including combat or an encounter. The Trap token remains on the territory-it is now disarmed. Structure Interaction: An opponent may build a structure on a territory with a Trap. 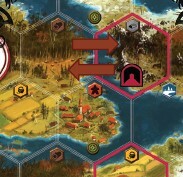 At the end of the game, if the only player tokens on that territory are the structure and the Trap (whether the Trap is armed or disarmed), the player with the structure controls that territory. Penalty List: Lose 2 popularity; lose 3 power; lose $4; and discard 2 combat cards at random. Opponents should be made aware of the various Trap penalties before the game begins. Toka: Once per turn when moving, either 1 character or 1 mech may move across a river. A mech can use this ability while transporting workers. The character or mech may not move across multiple rivers when using a Move action on a Factory card. Suiton: Your character and mechs can move to and from lakes. If combat occurs on a lake (some other factions have lake-related abilities), you may play 1 additional combat card. You may do this once per combat, not once per unit. If a mech transports workers onto a lake or if a character or mech transports resources onto a lake, you may not leave those workers or resources on the lake after moving off of it, nor may a worker move off of the lake without the assistance of the mech. You cannot build a structure or deploy a mech on a lake, but you may place a trap there. Ronin: Before combat where you have exactly 1 unit (0 workers and either 1 character or 1 mech), you may gain 2 power on the Power Track. Shinobi: Your character and mechs can move to any territory with a Trap token, regardless of the distance. When using the Shinobi ability, if your character or mech ends their movement on the same space as a disarmed Trap token (i.e., not in the middle of a Factory card's Move action), you may choose to arm the Trap. If using Shinobi results in combat, you may only arm the Trap if you win the combat. From an early age, Akiko, the niece of the shogun, read stories of warriors and adventurers in faraway lands. She was especially fascinated by the beauty and art of sword fighting. When she turned 16, Akiko begged her uncle to let her train at the most elite samurai war academy, and he agreed. She was a model student, practicing constantly until she excelled at fighting, shooting, strategy, and tactics. Bursting with pride, the shogun gave Akiko a special trained monkey named Jiro. As Akiko was entering her second year of training, her brother, a prominent engineer, went missing during a mission to the mysterious Factory in Eastern Europa. The shogun's advisors suspected that he had been captured by agents of the Rusviet Union. Trusting in his niece's skills as a samurai, the shogun has empowered Akiko to lead a large military expedition to subvert the Rusviets, recover the Togawa engineers, and discover the truth of the Factory.